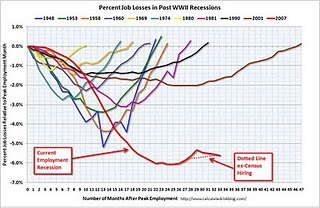 - An interesting discussion of chemistry unemployment issues. - I guestposted at Just Another Electron Pusher. The pictures were picked by Leigh, so they're (as usual) great. - Awesomeness from the Gaussling: more on rare earths. - Puns really aren't my thing, but they are Sharon's. - Pretty active discussion on students crying on their TAs over at Paul's. Could Big Pharma fill its openings with only elite groups' students? "Blessed are those who are the sons of KCN, DLB, PSB, WRR, BMT, PAW, DAE, ENJ, EJC, LEO, ABSIII, SVL, DWCM and other select fathers, for theirs is the Kingdom of Big Pharma." Is that comment true, from a supply perspective? How many people are immediately eligible for Ph.D. senior scientist positions in industry? Well, of course all the postdocs. Probably no more 20% of the graduate students (how many are 5th years? Hard to tell.) Okay, that's about 198 people. How many of those people are going to go to academia? Probably no more than 20%. That cuts the pool down to about 160 postdocs and new Ph.Ds who are out there, vying for entry-level positions in the pharmaceutical industry. With that very crude number in mind and the relative paucity of openings in medicinal and process chemistry in Big Pharma, my conclusion is this: Big Pharma's chemistry openings could easily be filled with only the workers from the most elite groups in organic chemistry. *Feel free to check my math -- I did it pretty rushed, and I'll revisit and double check tonight. It's time for another crazy idea from CJ -- one that combines issues of chemistry unemployment with academic chemical safety. What's the current ratio of chemical hygiene officers to researchers at R1 universities? 1 to 100? 1 to 200? 1 to 500? (Doubtful.) Raising that ratio to 1 to 50, say, would probably do a least a little good. In addition, their industrial experience would probably give their words a little more weight. Finally, the federal funding would alleviate the universities' concerns about money. I'm guessing this program could easily absorb about 250 unemployed mid-career scientists. I'm not sure it would be a great job for a mid-career scientist, but it'd be a job. Good morning! Between October 26 and October 27, there were 44 new positions posted on the ACS Careers website. Of these, 6 (14%) were academically connected and 1 (2%) was from Kelly Scientific. Nice work, if you can get it: Cubist Pharmaceuticals is looking for a Ph.D. chemist to be director of medicinal chemistry. "The primary responsibilities for this scientist will include the direct management and supervision of a medicinal chemistry group of 6-8 chemists..." Wait -- Cubist can't have only 6 to 8 med chemists, can it? Probably not. This seems important: Cryolife desires a M.S./Ph.D. analytical chemist to run its analytical chemistry lab. They are a "leader in the processing and distribution of implantable living human tissues for use in cardiac and vascular surgeries throughout the U.S. and Canada." Huh. HT Purification: Abbott is looking for a new Ph.D. chemist to work in its purification group; experience with both analytical and organic chemistry is desired. The sky is your laboratory: CO2Mer wants 2 Ph.D. organic chemists to work on its proprietary research; lots of expertise in synthetic chemistry and experience in "synthetic methodologies employing carbon dioxide (including supercritical carbon dioxide) " is desired. ACS Virtual Career Fair: Nov. 2 and 3 -- don't forget. Man, this new drive for getting manuscripts reviewed quicker is brutal! "Running a reaction at or near room temperature offers many potential advantages for scale-up operations. First, operations on scale are extended if large masses of chemicals must be heated or cooled. Second, running under extreme levels of heating or cooling requires increases energy expenditures. Third, reactions run at an excessively high temperature may generate unacceptably high amounts of by-products, including colored impurities that may be difficult to remove from the product." "The rule of thumb is that increasing a reaction by 10°C will double the reaction rate. In practice, the reaction rate may decrease or even quadruple." You mean you can't just lift the reactor out of a silicone oil bath, spray it off with hexanes and drop it into an ice water bath? Darn. Should Sam join a union? 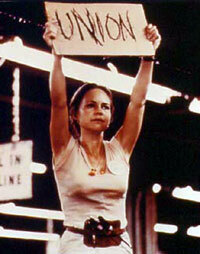 Credit cinemapolitica.org / "Norma Rae"
Sam at Everyday Scientist is thinking about joining the postdoc's union. He wants to hold common cause with other downtrodden postdocs, listen to Woody Guthrie guilt-free*, etc. I'm really not interested in delving into the politics of unions in the US, so let's just talk about the practical issues. It seems to me that actually becoming a member of the union (as opposed to simply donating the dues money) is a fairly serious issue: it says that when your brothers and sisters call for a job action (WRONG here, see below) because of a disagreement with management, you'll join them. *I prefer Billy Bragg myself (ironically). I'm agnostic on the issue myself, but you should be aware that there's much more to unions that job actions. In fact, many contracts -- including the one just agreed to by the UC system and their postdocs, puts strikes off-limits. If you want something to be concerned about, you should (IMO) be concerned about the implicit divide this suggests between management (the PI) and the workers (the postdocs). It would be far better if they could be completely on the same side. But as job prospects in academia deteriorate and the employer-employee relationship starts to seem more exploitive, that kind of relationship becomes harder to sustain. And anyway, there's no reason why the PIs should not be on the side of the postdoc unions. Sure, there's some financial incentive, since postdocs get paid out of grants. But many PIs want what's best for their postdocs anyway, and many seem to support unionization. (This is anecdotal; I haven't seen any studies.) I guess the bottom line is whether being involved in union activities will hurt your career prospects. So far, I haven't seen any evidence that it does. Good morning! Between October 21 and October 25, there were 84 new positions posted on the ACS Careers website. Of these, 37 (44%) were academic and 18 (21%) were from our friends at Kelly Scientific Resources. Am I crazy? This sounds like a fun job: Ortec, Inc. in "upstate South Carolina" is looking for a B.S./M.S./Ph.D. chemist with 10+ years related experience in polymer batch manufacturing to be a "plant chemist." Metal pipes, not green leaves, I'm guessing. Another one, different coast: Medical Chemical Corporation in Torrance, CA is looking for a production chemist. B.S in chemistry with strong analytical skills desired for QA/QC analysis. Wrinkle-free: Allergan (Boston, MA) is looking for a Ph.D. chemist to be a research chemistry manager; strong analytical background and knowledge of polymer surface characterization desired. Kelly: Nice job, folks. Lots of positions, all at least slightly relevant to chemistry. Want to be an organic photochemist? They might be able to help. ACS Virtual Career Fair: Don't know if you knew about it, but ACS Careers is having a Virtual Career Fair on November 2 and 3rd. Has the competition for Big Pharma Ph.D. positions gotten stiffer? It's my assumption that the competition for academic jobs has always been fierce; it is also my assumption that the fight for the highest-paying (i.e. Big Pharma) industrial positions has been slightly less fierce. Here's my question: if an incoming assistant professor's past research productivity was set at point A on the above bell curve, where would you put the average incoming senior scientist in Big Pharma? Here's my guess: in the last 5 to 10 years (as it has become more difficult to land a pharma position), the average incoming senior scientist's C.V. has moved from point C to point B. It was in Vietnam that the centralization of control reached its apex, with the White House dictating bombing targets and division and brigade commanders playing "squad leader" in the sky." We reached a condition in which the chain of command was in a state of dysfunction. I have always maintained that a chain of command must function from the bottom up as well as from the top down -- with every squad leader making squad leader decisions and reporting to his platoon leader, "Here's what I found, here's what I did, and here's why I did it." When squad leaders have someone telling them not only what to do but also how to do it, they stop being leaders, and so do platoon leaders and company commanders. Initiative is stymied, and decision making is replaced by waiting to be told. Combat action becomes tentative, and military action bogs down. Whenever I hear about professors telling their students how many equivalents of reagent to add or Ph.D.s telling their associates which reaction conditions to use, I cringe. Letting chemists make their own decisions (and live with the bad ones!) are the best way for people to learn; it will grow good chemists and good decision-makers. Anything else, and you're just another pair of hands. Did industrial chemistry have 'tenure'? Should it? While the story of Charles Davis is certainly sad, it is also instructive; it points to the differences between academic science and industry. Both Douglas Prasher and Richard Heck have talked about the difficulty of securing funding for their positions, but their stories only point to the holes in a fairly secure academic science safety net. In a slightly different world, Doug Prasher would now be a full professor at a university, happily teaching classes and writing letters for postdocs. In a slightly different world, both men would have tenure and struggle, but still be able to secure funding for their work. In the industrial world, there is no safety net. It seems, from stories of the old days of industrial chemists, that bench guys like Don Suddaby were employed well into their older years, quietly working away. Now it seems layoffs appear like off-kilter Biblical plagues that strike only middle-aged and older, leaving their younger colleagues wondering when the HR Angel of Death will darken their door. I know, I know -- a company is not a charity, and the world is more cutthroat (as Prasher would put it) and more competitive than ever. And yes, royalties and consulting gigs are there for the blessed few. Unleashing a force like tenure into the industrial world would not lead to more innovation and better outcomes -- I think it would be a bad idea. But I think there should be something. I don't know what the answer is, but it might just be a more humane future for industrial chemists. Good morning! Between October 19 and 20, there were 19 new positions posted on the ACS Careers website. Of them, 7 (37%) were academically connected. Stone and Tile: DuPont seeks a B.S. chemist with formulation experience to work in their Stone and Tile division as an associate investigator. "The individual will be expected to function as part of a multifunctional team, interact at the customer interface to understand market needs (Voice of the Customer) as well as develop and execute technical programs in the research lab to discover/develop new technology/products for the Stone and Tile Business." Don't you love those business terms? The Voice of the Customer speaks -- will you listen? Broader look: Monster, Careerbuilder and Indeed.com show (respectively) 270, 646 and 1,471 positions. (Doubtless, there are duplications.) Good luck out there. 4. You $#$#$#!!! moron! Did you try bleach? 5. Dude, you stink. Go away. 4. Yes, I've heard about the #$$%! smell. Yes, I closed the doors to my hood. 5. What smell? I don't smell nothin'. Charles Davis is a chemist, a Navy veteran, a white-collar guy who loves science. And he can't find a job. He lives in a motel room, and he keeps in his refrigerator and his cupboards the basics he can afford: bologna, white bread, green beans, grape jelly, peanut butter and soup. This has been Davis' home for 16 months. Davis has his days where he wonders where he'll turn. Members of Davis' family are struggling, and most of them live in Buffalo, N.Y. Meanwhile, the Veterans Administration can't help because he's not battling alcohol, drugs or depression. Still, he knows he can't give up. So, he makes his calls, catches a bus downtown, prays for strength and says to himself constantly: "To quit, you might as well die." I don't have anything wise or pithy to add. Mr. Davis is a good representative of the human capital that is being lost because of high unemployment in our industry. I wish him nothing but the best in his search; my thoughts and prayers are with him and folks like him. Daniel Levy is the blogger behind Organic Chemistry - Education and Industry. When he's not blogging, he runs his own consulting firm, DEL Biopharma. I asked Dr. Levy a number of questions about striking out on his own and being a consultant. What follows is an e-mail Q&A, which has been checked by Dr. Levy for accuracy. This interview was divided into two parts; yesterday was part 1. Today is part 2 of 2. CJ: What do you feel is the minimum number of years of experience required to be a successful consultant? Is this a path only available to those with more than say, 15 years of experience in pharma? Dr. Levy: The first consulting opportunity I found was after my first company closed. I had only 5 years of industrial experience and I was asked to design potential drug structures marrying features of both known matrix metalloproteinase inhibitors and thiazolidinediones useful as PPAR gamma antagonists. This work was incorporated into a patent on which I am a named inventor. Consulting opportunities can come at any time in one’s career. However, reasonable consulting fees, like full time salaries, should be realistic when matched to actual experience. There are many companies that will prefer to work with more experienced individuals. However, I think that, in today’s economy, we can all consider ourselves consultants. We work in an at-will employment environment with no implied obligations between employer and employee. Jobs in small companies generally last no more than 5 years and it is not uncommon to find people who have worked at 6 or more companies over the course of their careers. The only functional difference between being an employee and being a consultant is that consulting contracts are usually much shorter than typical full-time employment terms. Good morning! Between October 14 and October 18, there were 52 new positions posted on the ACS Careers website. Of these, 40 (77%) are academically connected and 1 (2%) is from Kelly Scientific Resources. That'd be pretty cool: The Chemical Safety Board is looking for accident investigators specifically for the BP Deepwater Horizon incident. If one of you makes it, you have got to tell me about it. "Telecommuting is allowed"?!?! Even cooler (sort of): SpectraTech is looking for a Ph.D. analytical chemist that has experience in nuclear forensic analysis. Let's hope that this is one of those quiet government lab jobs, as opposed to shooting it out with terrorists while Nicole Kidman and George Clooney are yelling at you. Urban heat island: Lawrence Berkeley is looking for a Ph.D. analytical chemist; "[t]he position has a specific emphasis on the study of interfacial chemistry of indoor and outdoor pollutants on environmental surfaces and their impacts on indoor exposures, the urban heat island effect and urban air quality." Yeah, that. - Milkshake is looking for a new position. Dude(tte), hire him. - What the heck is this weird looking glassware? Daniel Levy is the blogger behind Organic Chemistry - Education and Industry. When he's not blogging, he runs his own consulting firm, DEL Biopharma. I asked Dr. Levy a number of questions about striking out on his own and being a consultant. What follows is an e-mail Q&A, which has been checked by Dr. Levy for accuracy. This interview was divided into two parts; today is part 1. Chemjobber: Your story about what you did after you left Scios is (I think) pretty inspiring to experienced unemployed chemists -- can you talk a little about what lead to your decision to consult? How long did you search for a new position before considering consulting? Dr. Levy: The majority of Scios employees were laid off by August 2006. I was part of that group and, prior to our actual termination date, I was aggressively searching for new employment. Because Scios/J&J was required to give at least 60 days notice prior to a site closure, this search began in the beginning of July. At the time, I had 15 years of experience in biotech and the only opportunities advertised were for research associates or PhD scientists with up to 5 years of experience. My search was further complicated because this period was at the height of the biotech industry contraction and, in addition to the Scios community, many throughout the region were similarly affected. Since the job market was so bleak, I realized that in order to keep myself active in my chosen field, I had to find alternative ways to generate income. The answer was consulting. Blessed are the poor in yield, for they shall have to repeat their reactions. Blessed are those who mourn old lab romances, for they will have late-night drunk hookups. Blessed are the meek, for they are the silent Chinese postdocs who don't sleep, but have thick notebooks. Blessed are those who hunger and thirst for free food and drink, for theirs are the pre-seminar refreshments. Blessed are the merciful, for they will not ask or be asked in group meeting. Blessed are those with pure compounds, for they will praise God for their clean baselines. Blessed are the peacemakers, for they will be the confidants of all in the lab. Blessed are those who work alone in the lab, for they can play their music as loudly as they wish. Did you have a pop quiz during your on-site interview? It's October -- sometime in the near future, a lucky few folks will be visiting corporate campuses for on-site interviews. I don't really have much to say about interviewing that other people haven't; be your most impressive self, be willing to listen and interact is my mundane advice. The typical on-site interview consists of lots of one-on-one meetings with a 45 to 50 minute presentation by the candidate somewhere towards the beginning of the day. It's a long process, but it's a big decision for any group of people, so they're going to take their time. About half of the on-site interviews that I've been involved with as a candidate (an N that's not very big, BTW) also involve some sort of pop quiz. Mechanisms at the board, synthetic schemes and the odd named reaction were my experience. I've heard that in the UK, written and oral examinations are common for industrial positions. I'm not convinced of the value of those exercises; they're dependent on the vanity level of the quizzer. At the same time, only asking details of the candidate's own work is allowing the candidate to play with a considerable (hopefully) home-field advantage. It seems only fair to ask the occasional "here's a molecule -- how would you make this?" question. Beloved readers, what has been your experience with "test questions" during on-site interviews? Do you think they're worthwhile? ...The fellow on the right is Larkin Baggett, who is currently serving time in a federal prison for dumping hazardous waste. He owned a small business mixing chemicals for detergents in Utah, where he would dump hazardous waste on his property. In addition, he was pouring sulfuric, hydrofluoric and hydrochloric acid into the sanitary sewer. After he was arrested for his unique chemical waste disposal techniques, Baggett went for a life on the lam in Florida (why do they all go to Florida? ); he was found and injured in a shootout with federal agents. Let's be honest -- hazardous waste is difficult to deal with and state and federal regulations don't make it any easier. That being said, it's the responsibility of chemists to do the right thing and make sure that stuff makes it into the right disposal drum and not into the environment. And it's worth remembering, the long arm of the law is there to encourage you too. Good morning! Between October 12 and October 13, there were 17 new positions posted on the ACS Careers website. Of these, 7 (41%) are academically connected and 1 (6%) is from Kelly Scientific. Yeah, you're the guy/gal, sure: FMC is looking for a principal process engineer (B.S. ChemE). This is one of those positions that I'd be really suspicious of: "This position offers you the unique opportunity to "keep your hand in the game" and also play a leadership role in a global S&P 500 corporation." Look, if you're looking to keep your hand in a game as complex as chemical engineering, you're out of the game! New Jersey: Jacobus Pharmaceutical is looking for a Ph.D. medicinal chemist with experience in small library work; the company is working on anti-malarials and anti-tuberculosis compounds. Carlsbad: Regulus Therapeutics is searching for a M.S./Ph.D. analytical chemist (3+ years experience) to perform HPLC and LC/MS on oligonucleotides, peptides and small molecules. Carlsbad is a pretty lovely place, so far as I could tell from the freeway. Santa Clara, CA: Abbott desires a B.S./M.S./Ph.D. senior stability scientist (6+ years experience) to act as principal investigator into drug stability studies. Be sure to set your oven temps correctly! CJ: How much lead time did [you] have for the Morning Edition conversation with Steve Inskeep? Joe Palca: I was able to download the Nobel press material at approximately 5:50 a.m. ET. I had arranged to speak with Joe Francisco at 6:15. I had to write an Intro and questions for Steve Inskeep by 6:30. We did our chat live at 6:40. CJ: Did [you] listen to the press conference? JP: No. I listened to the Negishi/Purdue press conference…but I can tell you that there was not a single question about the science. JP: I only did one live chat with Windham. That was at 7. I finished with Steve at 6:45, so I had a few more minutes to review the press materials. The other newscast piece you heard from me was prerecorded around 7:15. CJ: Who did [you] consult with to understand palladium catalysis? JP: Joe Francisco. But truthfully, as someone who enjoyed organic chemistry in college, I felt confident that I could explain a palladium catalyzed reaction that “makes new molecules” without too much difficulty…I would have needed more advice if I had wanted to get into the specifics of the reactions. CJ: What could the chemistry community do to help reporters like [you] do a good job? JP: The American Chemical Society has now joined the American Physical Society in being proactive in providing experts…it is extremely useful. (CJ here again.) I'll stick to my previous analogy: the science Nobel Prizes must be the science reporter's equivalent of Iron Chef. Palca had about 50 to 60 minutes to prepare for two live conversations on palladium catalysis. It took me about an hour to write up my thoughts on the palladium Nobel; organic chemistry is my daily life, and I'm not sure I did much better. It's also good to know that ACS is willing to help on chemistry's (hopefully!) one big day each year. Thanks again to NPR's Joe Palca for his willingness to comment about his reporting process. Fixed that for ya, dude. Who started the 'matchmaker' palladium meme? Sharon of Icanhasscience (check it out!) notes in the comments that the AP's other report on the palladium Nobel prize used the analogy of a singles bar for palladium-catalyzed cross-couplings. That article is one of the few in the media that didn't seem to use the "matchmaker" meme to describe the reaction. I'm terribly curious -- who was the first reporter or news outlet to use this analogy? I've never heard metal cross-couplings described this way; I have to admit it's a fairly accurate picture to describe the reaction mechanism. With the help of Google, I see that on October 6, USA Today, Scientific American, New Scientist, Agence France-Presse, NIKKEI.com, Christian Science Monitor, Science Now and MSNBC.com all used the "matchmaker" meme. Is it the quoted Jeremy Berg? Inquiring minds wish to know. P.S. Has any other chemist heard Pd reactions described this way? Am I the only crazy one who hasn't? Good morning! Between October 8 and October 11, there were 36 new positions posted on the ACS Career website. Of these, 30 (83%) are academically connected. Johnny-come-lately? : The Toyota Research Institute is hiring a Ph.D. chemist with experience in inorganic synthesis of materials for batteries. It's a temporary position (through Prymus) that's only offering 60-70k. Look, I'm just gonna say this once: this is a hot field. Dunno why Toyota is paying so low for a position that's been searched for by darn near everyone. Whoever gets this position will have two or three other offers in hand, I'll bet. Huh: Sanofi-Aventis is looking for B.S./M.S. research associates in oncology chemistry (8+/5+ years experience desired, respectively.) Glad to see someone's hiring experienced folks. A broader look: For the search term "chemist", Indeed.com, Careerbuilder and Monster have (respectively) 4541, 295 and 667 postings. How did the national media do on the palladium Nobel? The methods have been used to artificially produce cancer-killing substances first found in marine sponges, the academy said in its citation. While clinical testing has started, it's not yet clear whether they will turn out to be useful drugs.It's also being used to create new antibiotics that work on resistant bacteria and a number of commercially available drugs, including the anti-inflammatory Naproxen, prize committee member Claes Gustafsson said. "There have been calculations that no less than 25% of all chemical reactions in the pharmaceutical industry are actually based on these methods," Gustafsson said. Palladium-catalyzed cross coupling has also been used by the electronics industry to make light-emitting diodes used in the production of extremely thin monitors, the academy said. The approach developed by the winners is widely used in the pharmaceutical industry, in research labs and in commercial production of substances like plastics, said Joseph Francisco, president of the American Chemical Society and a colleague of Negishi's in Purdue's chemistry department. "It's truly quite fundamental work," he said. By using the metal palladium as a catalyst to make carbon atoms bond to each other, the approach makes those bonds happen "very easily, very cleanly," he said. It requires fewer steps than previous methods and avoids having to clean up unwanted byproducts, he said. Drugs, plastics and many other industrial chemicals consist of large carbon-based molecules. However, getting one carbon atom to bind to another is often not an easy task. Nearly a century ago, a French chemist named Victor Grignard found that coupling a magnesium atom to a carbon atom pushed additional electrons to the carbon atom, making it easier to bond with another carbon atom. That method worked, but not always perfectly, sometimes producing too many unwanted byproducts. Hurray for getting ol' Victor a mention, boo for making the latte-sippers in Manhattan think that organic chemists hadn't developed new methods of C-C bond formation between Grignard and Heck. ...You know, nature has figured out a lot of really remarkable reactions. And the trick, as you say, is to put them into some kind of format where you can use them in a commercial process and make enough of it to use. INSKEEP: And three chemists working independently have come up with this process and they win the Nobel Prize for chemistry. PALCA: Basically, these three chemists used the metal palladium as a catalyst. Catalysts are a little like matchmakers: They bring atoms together that probably wouldn't get together on their own. Mr. FRANCISCO: That actually makes it very easy to make new bonds and connect atoms and connect various groups to make new compounds. Palca was suffering through the reporter's version of Iron Chef -- today's secret ingredient is Palladium Cross-Coupling! And he has to attempt to translate it into English -- a tough job, even for an organic chemist. All in all, a pretty good job by the dreaded mainstream media. Good luck next year, guys. What is a good nickname for an experienced chemist? ﻿One of my favorite San Diego memories is sitting in a doctor's office and listening to a younger and an older Marine chit-chat. When the younger Marine asked about the past of the older one, the older one chuckled and said "I'm just an old, salty gunny." Is there a nickname for older, very experienced chemists? You know the one: the man or woman who's spent a lifetime at the bench, the one who's seen projects and fads come and go, the one who knows where everything in the lab is (and isn't), and the one who always seems to know the right reagent to try when everything else doesn't work. I can't really think of any off the top of my head. I'm sure there are lots of potential terms, but none that I can think of. Certainly, there are old sailor insults that could be converted: "I've [urinated] more hexanes than you've ever used" or whatever. But I can't think of a term. Good morning! Fresh electrons from the Bureau of Labor Statistics: the official U3 unemployment rate is unchanged from August at 9.6%. The broader measurement of unemployment (U6) is higher at 17.1%, up from August's 16.7%. More analysis as commentary rolls in. Thanks, as always, to Calculated Risk for the chart. Should Ph.D. students delay graduation because of lack of employment? But it reminded me of something that I've heard is going on: grad students delaying their graduation because of their difficulty in finding employment (other than a postdoc). I'm going to guess (hope?) that there's not a ton of evidence outside of anecdote that this is happening, but let's address it with the assumption that it is. The chemistry job market (especially for entry-level positions) is structured such that you're basically competing against the people who entered graduate school at the same time that you did. If lots of students from the same cohort delayed graduation, you'd still be competing against the same people plus the people in the year behind you. Adding to the numbers of your competitors doesn't seem like a good idea to me. You have two graduate students. If they both decide to look for a position now, they will be competing against each other. If they both decide to delay graduation, they will still be competing against each other. Should they (and if so, how?) cooperate to find an optimal solution? Unfortunately, I suspect that problems like this is why the postdoc market is also kinda full right now. Sorry I don't have much better news than that. *Note to J-bone: a run-stuffing interior lineman is always helpful. Should BS/MS chemists look oddly at the word "technical"? While reviewing the biographies for the candidates for positions in the Division of Organic Chemistry elections*, I noted that there weren't any candidates that had a M.S. It reminded me of a conversation I had with a friend about the DOC's award category for non-Ph.D. chemists called "Technical Achievements in Organic Chemistry." My friend (not a Ph.D.) found the title of the awards somewhat less than complimentary. The purpose of the Technical Achievements in Organic Chemistry (TAOC) award program is to recognize outstanding contributions to the field of organic chemistry from accomplished Junior-level chemists (i.e., those who do not have a Ph.D. degree or equivalent) pursuing careers in chemical industry at research institutes. ...(A) a letter (not e-mail), containing the address of the nominator and information written on company stationary, of nomination that presents evidence that illustrates the accomplishments, creativity and independence of the nominee (B) a copy of the nominee's CV (including work address and e-mail) that includes a description of their educational background and experience, and publication and patent record and (C) any other information that documents the special achievements and/or contributions made by the nominee. I've actually met and seen a number of awardees during their award seminars and elsewhere, and they're just as impressive as you might imagine. So there's no arguing that 1) the awards are deserved and 2) I'm glad that they're getting recognition. I do think there's something odd about the word "technical", especially when (of the presentations that I saw), there was hardly anything tactical or small-bore about them. They were more-or-less indistinguishable from the typical program-based talks that you'd see Ph.D. chemists give at an ACS conference. The text of the nominating documents ("accomplishments, creativity, independence") does not really lend itself to the word "technical" either. Problem is, what do you call a B.S./M.S. only category? I can't come up with a good name. Readers, is my friend right? Do you have a better name? *I didn't vote for any of them. Can't figure out what the positions are for. Good morning! Between October 5 and October 6, there are 21 new positions on the ACS Careers website. Of these, 7 (33%) are academically connected. Green-collar jobs: While I really dislike that term, there's no doubt that Dow Corning's search for a lithium-ion battery R&D manager (Ph.D. electrochemist with 5+ years experience desired) and a photovoltaic specialist (Ph.D. materials scientist desired) are connected with the push towards alternative energy sources. Flavours! : Givaudan is a company that makes flavo(u)rs and fragrances; they desired a B.S./M.S. chemist with experience in using enzymes to perform chemical transformations. You'd be working "at the interface of biology and organic chemistry with emphasis on developing biotransformation processes for making flavor molecules." Sounds pretty interesting to me. Ohio! : Ashland Chemicals desires a Ph.D. organic/polymer chemist to "a key role in expanding a bio-based resin platform that supports Ashland Performance Materials' adhesives and composite resins businesses." Experience with using enzymes to convert biomass to compounds is a "definite plus", as is experience with bio-based polymers. Huh. 3 chemistry professors, Richard Heck (formerly of the University of Delaware), Ei-ichi Negishi (Japanese descent, of Purdue University) and Akira Suzuki (Japanese descent, of Hokkaido University) were awarded the 2010 Nobel Prize in Chemistry "for palladium-catalyzed cross couplings in organic synthesis" by the Royal Swedish Academy of Sciences. These are techniques for bonding (or connecting) smaller carbon-based molecules together to make larger carbon-based molecules. Creating carbon-carbon bonds can be difficult and can sometimes involve using dangerous, impractical or environmentally unfriendly reaction chemistry; the techniques pioneered by Suzuki, Heck, and Negishi make these reactions simple enough for novice chemists to perform and practical enough that they can be run on multi-ton scale. Since their introduction in the late 1970's, palladium-catalyzed chemical reactions have touched every part of the field of chemistry, including life-saving drugs, plastics and organic LEDs. The modern pharmaceutical industry would not be able to produce many of their products without palladium-catalyzed reactions. The prize has been long-awaited by many chemists. "It's about damn time", said Chemjobber, a very junior synthetic organic chemist. "I don't know what it took to get those Swedes to finally get their thumb out." It is believed that part of the reason is the rules of the Nobel Prize: there can be no more than 3 awardees at one time, and they all must be living. Many chemists contributed to the field of palladium-catalyzed reactions. Professors Sonogashira, Tsuji, and Kumada could have all been part of this award, and the chemistry Nobel committee is notoriously controversy-shy. Professor Heck has retired and currently lives with his wife in the Philippines. Professor Negishi is still teaching and research at Purdue University in West Lafayette, Indiana. Professor Suzuki is still teaching and researching at Hokkaido University in Sapporo, Japan. What are the long-term consequences of losing mid-career pharma scientists? The core of the retooling issue in regards to the long-term is: who is retooling? If extremely senior people are getting out of the industry, it's probably a net loss to the chemical enterprise, but they're more likely to remain somewhat connected to the industry via consulting, etc. If large groups of chemists that have been in the industry for 5 to 15 years begin leaving the industry and "retooling", I believe that this would be a very serious issue, in that their experience, leadership and potential positive changes they would have made to the industry would be lost. The analogy I would make is this: back in 2006 or so, there were a spate of articles about the mid-rank officers who were leaving the military. For example, Maj. John Nagl was considered one of the US Army's leading thinkers on counterinsurgency theory; he left in 2008 (?). Now that he's employed by CNAS, he's not exerting his influence directly on the military. That's a net loss for the future, I'd think. If he were to retool and move out of the policy sphere completely, that loss would be even greater. There's probably a break-even point for investment in a pharmaceutical labor pool; I'm going to guess that it takes at least 5 years to train a medicinal chemist to the point that they're at the top of their career potential. If you're shuttering sites and laying people off, some of those people and some of the potential long-term gain to pharma will be lost for good. While some of the more talented scientists would probably be picked up, some other talented people will decide "pharma is not for me" and leave. If the job market for medicinal chemists does not recover, the loss will likely be permanent. What percentage of these mid-career scientists can pharma lose before there are real, negative long-term consequences to the industry? Lame to say, but we're about to find out. Good morning! Between October 1 and October 4, there were 50 new positions posted on the ACS Careers website. Of them, 33 (66%) are academically connected and 1 is from our friends at Kelly Scientific Resources. Enjoy the kebab: Ideal Innovations, Inc. is looking for B.S. chemists to be explosive chemical analysts; 2 years experience with GC/MS, FTIR, XRD and XRF is desired. Don't worry, you'll be fine... in your compound in Afghanistan. (No, really.) This has got to pay incredible money. Super-multi-nanodisciplinary scientist needed: Check this out. Ventana Medical Systems is looking for a M.S./Ph.D. chemist and here's their list of things they want: "Expertise in Organic, Bio-organic or Material Scientist in the area of nanotechnology particularly self-assembly, nanoparticle synthesis, synthesis of organic compounds, novel bioconjugation methods, biological molecules i.e. antibodies and other proteins as well as nucleic acids, characterization of such conjugates, development of bioassays leading to the simultaneous detection of various proteins over-expressed in cancer (Immunohistochemistry IHC) as well as genes (in-situ hybridization ISH) assays highly desireable." Okay, dudes -- this is like 3 jobs rolled into one. RTP: Novan is looking for a Ph.D. analytical chemist with experience in pharmaceutics for QA/QC drug development work. Qualifications include "[s]trong work ethic and ability to meet challenging deadlines"; good luck with that. In the middle of the Scott Kern thread (50+ comments and counting! ), a discussion about the difference between M.S. and Ph.D. scientists broke out. While I don't wish to relitigate the issue, it touches tangentially on something that I've been wondering for a while: how does a young grad student know 1) if he or she should get a Ph.D. and 2) if (s)he gets a Ph.D., how do they know if they will get a job? Allow me to go on a tangent for a bit: the NFL draws most of its players from college football. If a college football player enters the draft, that player is no longer eligible to play in college. Faced with such an irreversible decision, the NFL has instituted the Draft Advisory Board, which can advise a college football player if the player will or will not be drafted and where he will go in the draft. While the recommendations of the board can be ignored by the player, the board has apparently proven to be fairly accurate. Why isn't there a similar board run by ACS? The decision to get a Ph.D. is more or less equally irreversible. You could get somewhat senior people from industry (group-leader level) and having them anonymously review (anonymous?) CVs and research summaries. They would answer one question only: how does the student's credentials compare to that of recently hired employees? You could imagine any number of possible recommendation rubrics, but I'd go with: not likely to be hired / average candidate / above-average candidate. This is something that you'd think would be good: students can't really rely on their peers for such recommendations. While faculty members are going to be fairly accurate at their guesses, there's conflict-of-interest and privacy issues that might push a student to want a 2nd (or 3rd) opinion. While I'm not entirely convinced* of the "Ph.D. glut" theory, this board might be a way of alleviating that problem, too. Readers, what do you think? Tell me how wrong I am, please. *Meaning that I haven't looked at the data and/or given it enough thought to have a real opinion. Uh, hi, guys! So yesterday was the highest trafficked day in Chemjobber history, which is really cool. When I'm not arching an eyebrow at passionate professors of medicine, I'm covering the chemistry job market, both quantitatively and qualitatively. I'm also tracking the long term trends in the chemistry labor market, looking at chemical safety and other aspects of life in the laboratory. 1. Hey, is this a crude NMR? It sure looks like a crude. 2. Did you run that reaction I asked you about last time? No? Dude, I'm telling you, it's the way to go. 3. Didn't Kinakutamari already publish on this? 4. Could you write a little clearer on the board? I'm confused. 5. Have you ever thought about putting a methyl there? 6. What's your rationale for the stereoselectivity of that reduction there? Have you thought about the Cram chelate model? 7. Pass me another slice of pizza. 8. Is that the material that you stole from me? No? Well, I can't find it, so someone stole it. 9. Didn't you tell us about this last month? 10. Hey, is this a crude NMR? Good morning! Between September 28 and September 30, there are 18 new positions on the ACS Careers website. Of these, 6 (21%) are academically connected and 2 (7%) are from our friends at Kelly Scientific Resources. Cars: MKS Instruments desires a M.S./Ph.D. analytical chemist with at least 4 years experience "with Classical Least Squares and other Chemometric Techniques". "Experience in Automotive and Combustion Engine Testing a plus." Hmmm: NetChem in New Jersey desires "senior organic chemists". Well, I hope you get better than 45k. (+ 4-8% of total sales! Wow!) Anyone here have experience with them? Little lost lamb: Got a M.D. and a board certification in cardiology? Well, BMS wants you to come work for them, to help launch their new drug Apixaban. Because it's the American Chemical Society. WTG Kelly: Kelly checks in with a couple of relevant positions: an adhesives and coating position and a product development position, too. Nice, guys.